Yikes! Be careful Wendy! You pull a book from there, it just might fall and hurt you! I want your books and the shelf, Wendy!!! Wonderful to have so many great words nearby! I call it entertainment storage. What if something happened to the TV and computer. At least you'd have your books. At least, that's my rationalization. Wow. This is the last time I complain about my TBR pile! Good luck with all that. Yikes! My shelf of concentrated TBR is much smaller, thank goodness. This isn't to say there aren't books all over the house waiting to be read, but the most obvious location isn't quite so scary. Thanks for this! You've made me feel better about my TBR pile. OH my goodness! THAT is quite a stack! Thanks for the TBR sampler - but don't you have a whole ROOM full of those things :-D? I like the desk and hutch, and it looks like you've got plenty there to keep you busy! This reminds me how we just bought a new bookshelf recently and it's already been filled up! I'm having to stack on top and do double layers again. Ah, sigh, at least we know we're not alone in our book-love. It may be untidy but it sure looks like a lot of great reading ahead of you. Wow, what a great bunch of books! Holy cow, Wendy! Such a lovely stockpile of books! I hope there are no kitties hiding under any of those stacks! lol I am impressed that your books are neatly piled. My cats would never let them stay that way! One would poke the books until they fell over, another would sit on them, another would jump on and off them and thereby knock them over...! OH MY!! But this is also why I refuse to put them all in one place. Spread out in several different places in the house makes them seem less . . . well . . . like they might attack. Can't you just hear them whispering, "Weeeeeennnndddyyyyyyy...reeeeeeeaaaad me." I beg to differ with your caption - this looks VERY tidy. Everything neatly piled! except for that part, my office could compete. Enjoy! I love to see other people's bookshelves! I am happy that for now all my books fit in the shelves and the floor is empty. lol-Boy oh boy does that ever look familiar! Shelves, piles, bags... I love it! I love looking at pictures of books! And at least your TBR titles are on shelves (well, some of them, anyway) - mine are in stacks on the floor beside my bed! That is awesome! And I thought I had tons of TBR books waiting at home. I think we all can sympathize. An ironic image to say the least. Love it!!! 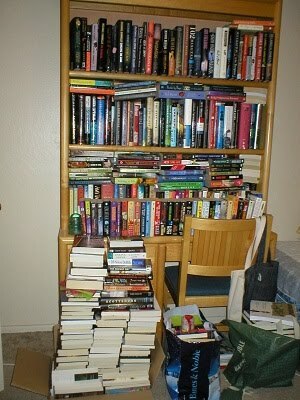 My tbr books are currently tidy as I just got the bug to re-do the shelves but usually they are far worse than this. Thank you for dropping and and commenting! I won't be running out of reading material anytime soon. All the books in the photo are ones I bought, got in trade or what have you. My review books are kept in a separate location. Florinda - Shh! Don't give away my secret. ;-) I didn't want to overwhelm everyone with the magnitude of my TBR collection all at once. I don't think it's obvious from the photos but the top two shelves are double shelved and the desk portion is triple shelved. You have more than I do! I don't feel so guilty anymore!!! Well, then! I'm feeling much better about my TBR books. Perhaps I should quite calling mine Mt. TBR because you win! You make me smile. That is much what my bookshelf looks like. And I have 4 boxes of books in the basement, too! I need a bigger bookshelf! LOL I love this!! Also I just learned about that Ning Social Network Book Bloggers from your blog - I was roaming all over trying to catch up. I signed up and my profile is pending approval. Most of my books are all still packed and that makes me so sad. The problem is finding space for them all so my entire apartment looks soooooooo similar to your corner. Isn't it awesome to be surrounding by books? Thank you all for your comments. :-) I love looking at other people's TBR shelves, stacks and piles too. That's a great picture! I don't even want to think about rounding up all of my TBR books - last count, I was nearing 200. I'd need a wide-angle lens!